It’s official, I’ve made it through an entire month of my vegan, gluten-free, corn-free and (mostly) soy-free diet. There have been a few occasions where I’ve mistakenly eaten corn, gluten and soy but for the most part I think I’ve done really well. Some people have asked me if I am feeling better yet and the truth is that I haven’t seen much improvement. My body temperature is running hot, I still get overheated, sometimes I get randomly nauseous, my energy is pretty low… I don’t feel as terrible as I have in the past but I don’t really feel that great right now. From what I understand it is going to be between 3 and 6 months before I really start feeling the effects of the diet. At least I’ve got one month down, just a few more to go. The good news is though that I FINALLY was able to make an Indian dish that tasted good, really good. So good that I practically ate the entire pan. And it only took 30 minutes – a miracle! Once again, this recipe is NOT mine, I found it on epicurious.com and you can view it here, Indian Spiced Cauliflower and Potatoes. I don’t even think I changed anything, I made some small substitutions (like using red potatoes cause they were on sale) and I left the skin on the potatoes because I felt like it. The only thing I would do differently next time would be to use parchment paper instead of foil on the baking sheet because the potatoes stuck to the foil like glue. But this recipe is super good, go make it now! Put oven rack in upper third of oven. Preheat oven to 475°F. Toss cauliflower and potatoes together in a bowl with 3 tablespoons oil, cumin seeds, and 1/4 teaspoon salt. Spread onto a shallow baking pan (covered in parchment paper for easy clean-up) and roast, stirring occasionally, until cauliflower is tender and browned in spots and potatoes are just tender, about 20 minutes. While vegetables are roasting, cook onion, garlic, jalapeño, and ginger in remaining 2 tablespoons oil in a 12-inch heavy skillet over moderate heat, stirring frequently, until very soft and beginning to turn golden, 8 to 10 minutes. Add ground cumin, coriander, turmeric, cayenne, and remaining 1/4 teaspoon salt and cook, stirring constantly, 2 minutes. Stir in water, scraping up any brown bits from bottom of skillet, then stir in roasted vegetables. Cook, covered, stirring occasionally, 5 minutes. I used more potatoes than cauliflower but I weighed everything out to equal 3 lbs. I also used 1/4 tsp less salt than original recipe calls for. This recipe has just the right amount of spice to it. I will definitely be making this again. Well done! Both on getting through your first month and on this dish. 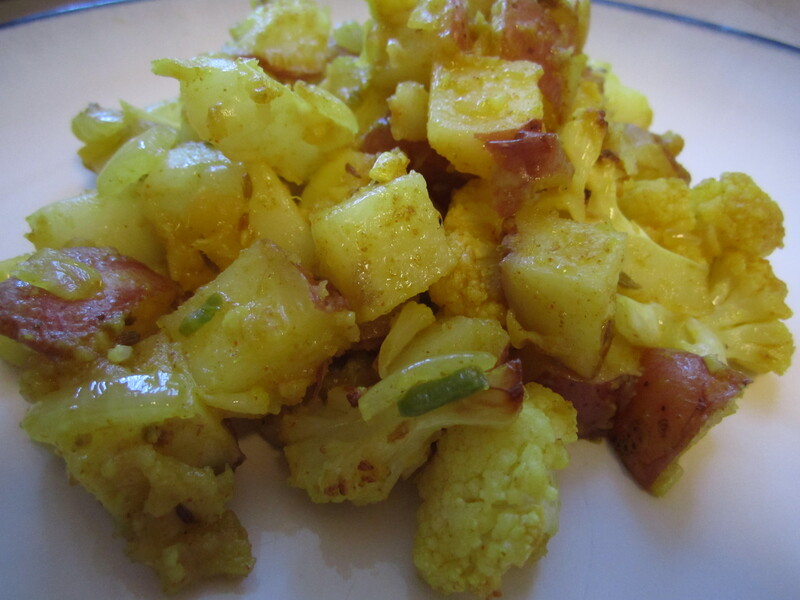 Aloo gobi is one of my favorite Indian meals!